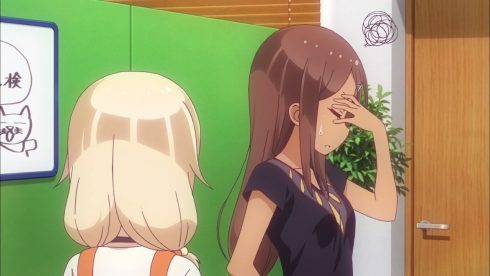 From the perspective of a manga reader, this episode was quite interesting, because, with the exception of the last 30 seconds of it, none of this material existed before. 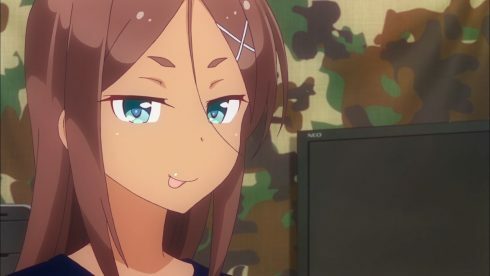 That’s right, we have an episode here that is 99% anime-original. Let’s take a look at how it turned out. I could not help but laugh at Nene’s behavior in the beginning. Careful camera manipulation to try to get a view up a character’s skirt (or down their shirt, or from some other inappropriate angle) is… well… typical gamer behavior. 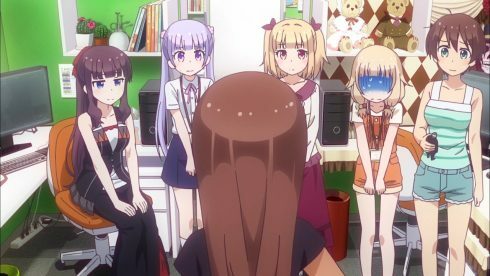 People are going to do that, so the fact that Aoba went to the trouble of rendering her character’s underwear speaks well for her preparedness, and Nene is just doing her job: testing what happens when she does something that many gamers are going to do. On the other hand, in most games, there’s not supposed to be anything of interest to see under there anyway, so Umiko’s irritation is understandable. 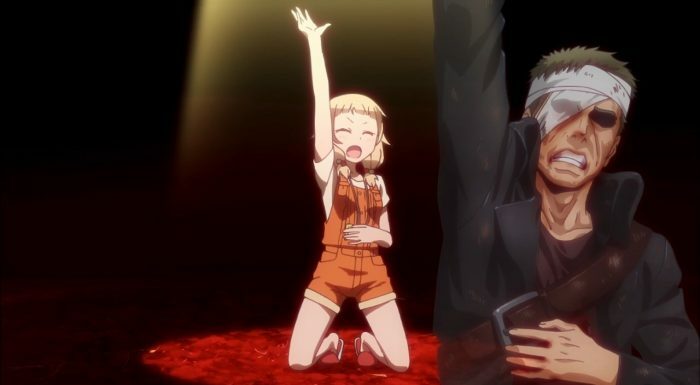 What makes this unusual is Hazuki deciding to change the specifications to allow such shots to be possible for all characters if people are willing to go to the trouble for them. Well, ok, that’s just Hazuki, but it does end up making more work for everyone. Changing the specifications for a game at this stage can cause trouble, so it’s not advisable. 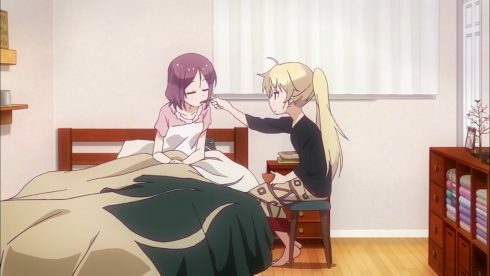 Next we have poor Rin coming down with a cold. 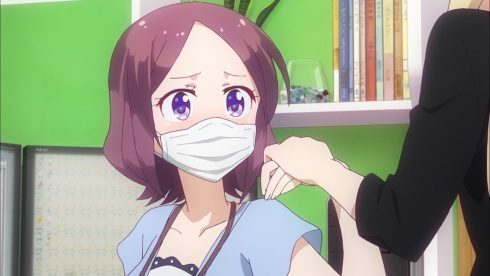 I will admit that crunch time at a video game company is probably the single worst time to get sick, because it feels like you need at least 30 hours in a day in order to get things done. Thus, a diligent person like Rin would feel incredibly guilty about having to take a sick day right now. That said… folks, when you’re sick, don’t come in to work. You’ll have trouble accomplishing much because you aren’t at 100%, and things like that mask Rin’s wearing only have limited effectiveness in preventing other people from catching what you have. Thus Ko, at her manliest, escorts Rin home and stays there to make sure she rests. Rin doesn’t seem too unhappy about the pampering though, which by now should be no surprise to any viewer. 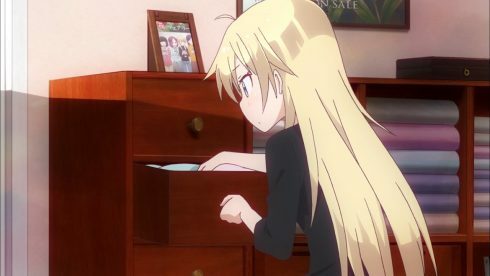 We can see in her apartment she has the same photo that she keeps on her desk at work, showing just how important those feelings are to Rin. Also she’s quick to seize the opportunity to have Ko feed her. 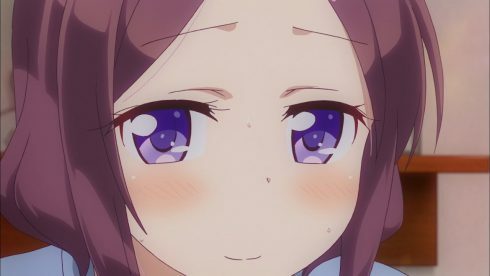 Ko, for her own part, doesn’t display her feelings with the blushing and girlishness that Rin shows us, but the very fact that she goes so far out of her way to take care of Rin speaks volumes in and of itself. 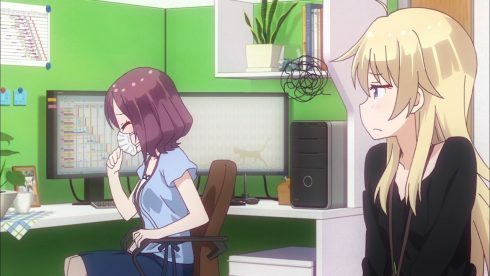 Ko, after all, is the woman who tries to do twice the work of anyone else, who stays later, sleeps in the office, then gets up and starts working again right away. 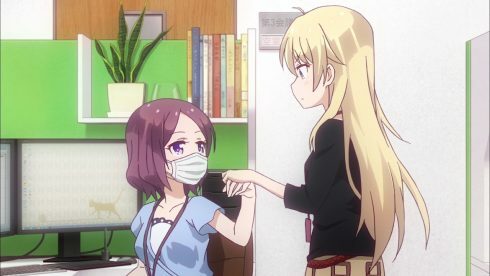 By taking the day off to nurse Rin she basically says without so many words that taking care of Rin is more important to her than any of that. I can hardly blame Rin for being flushed about that. And, you know, because of her fever, but nevermind that for the moment. Anyway, back at work, it’s a little depressing how quickly Hajime started goofing off once the KoRin ship sailed out of the office. 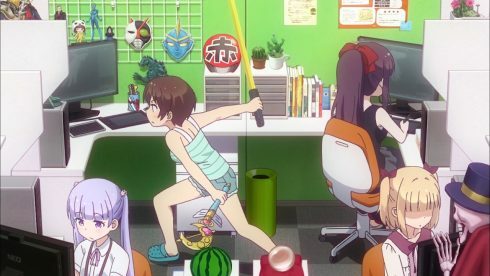 Even if you argue that she was working through poses and motions for the game, she was pretty clearly getting carried away. 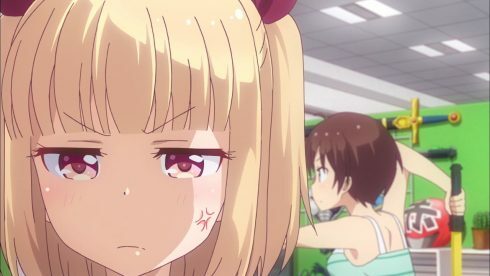 I’m disappointed in you, girl! 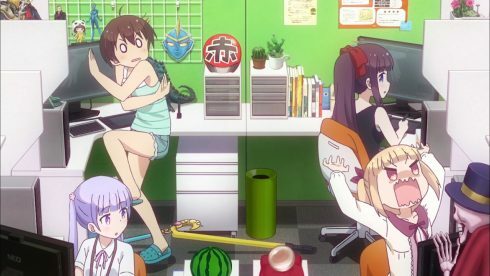 Even if your boss isn’t there, and you are clearly a somewhat hyperactive attention-deficit otaku, you still have a responsibility to keep yourself under control and not disturb the people around you. Like Yun, who quickly loses her patience with the noise. 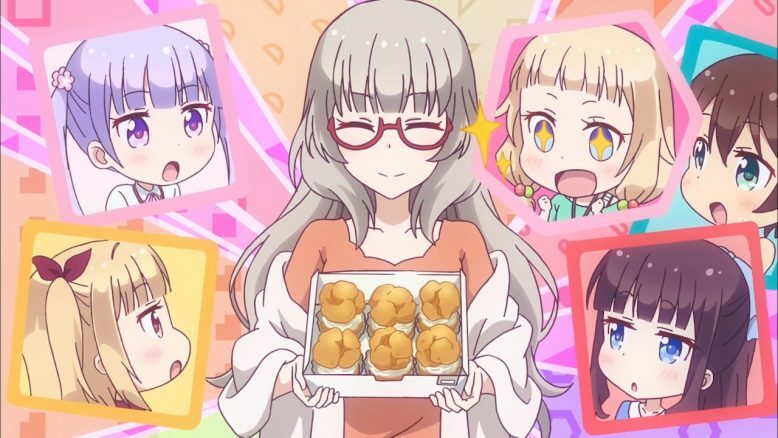 And again, after they get back to work for a bit, all it takes is Aoba asking to borrow one of Hajime’s toys for reference to set off Hajime, Yun, and Nene (who can’t seem to stay out of things) on a fangirl kick about the series it came from. 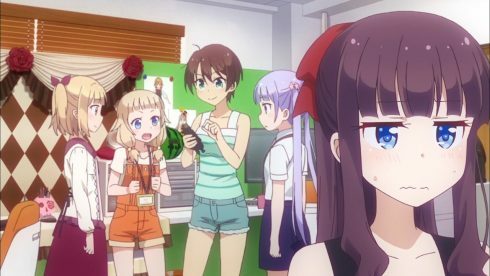 I have to feel sorry for poor Hifumi: as the most senior person in the group she technically should take responsibility for speaking up and telling everyone to get back to work, but… well… she doesn’t speak if she can help it. 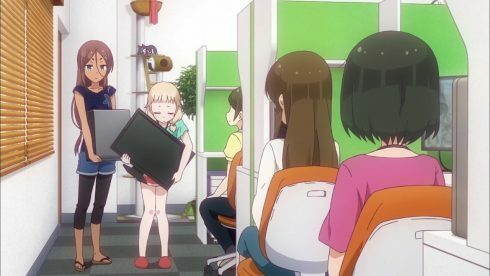 At least Umiko came by to drag Nene back to her desk and tell everyone else to get back to work. 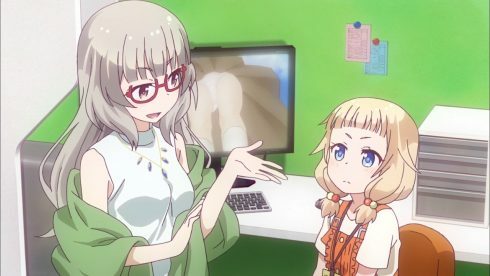 Umiko’s talk with Nene following that contains many interesting details. 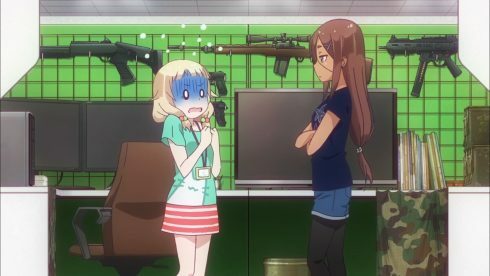 Nene took the summer job at Eagle Jump because she was worried about Aoba. 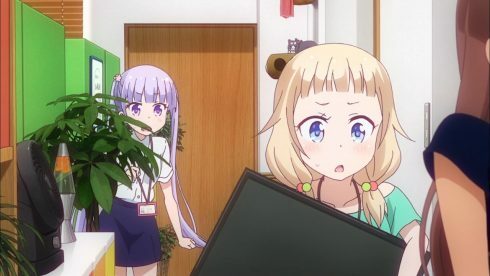 Even though Nene’s something of a goofball, she didn’t come there just to play around, or just to be near Aoba, but because she was genuinely worried, and wanted to make sure that the company her oldest friend had gotten into was actually a good place. 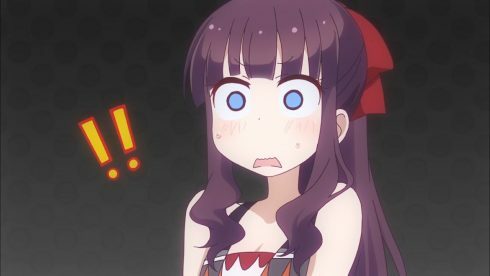 The revelation that Aoba had actually been accepted to an art college along with a good friend of theirs is pretty big news, and a good tie in to manga readers who should be able to realize who that friend is. 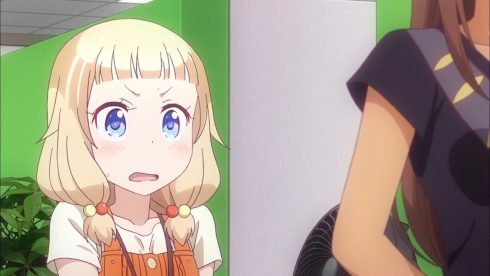 Umiko makes a strong counterpoint to Nene’s reason for being there: no matter how good your intentions, you will be judged based on how you act. Something you need to keep in mind in the working world. Most employers wouldn’t be as forgiving as Eagle Jump is. 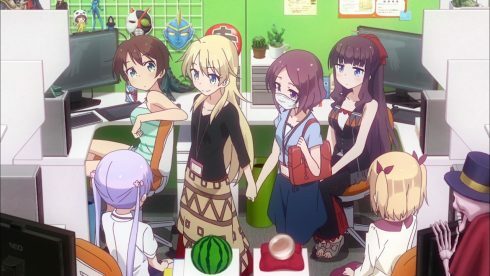 Our core four staying overnight because they can’t work on the weekend serves mostly as a transition into the fanservice. And good gracious do the fans get serviced. 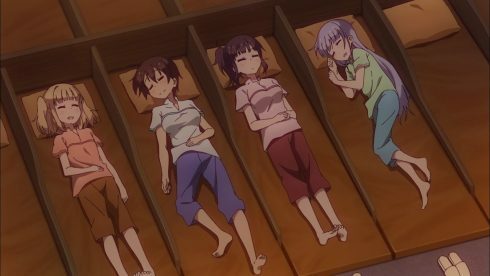 They all go to a bathhouse, play around in the water, take showers, and finally get some sleep since apparently bathhouses with sleeping areas are a thing in some Asian countries. 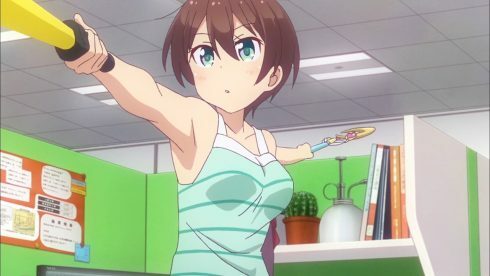 Yun seems to have a fair amount of insecurity about her body when comparing herself to Hajime and Hifumi, both of whom are probably capable of making most people feel a bit inadequate. 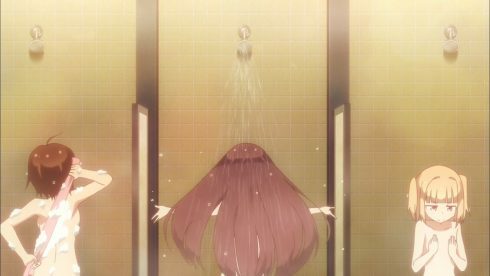 Also, some truly beautiful animation is dedicated to Hifumi’s shower scene. 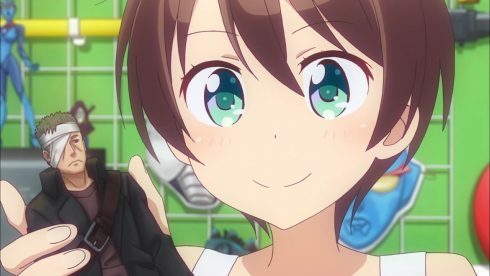 While I would never say that fanservice is a reason to watch this series, at least when they do choose to include it they make it look very nice. Rather than run too long, let me touch on the final moment: the only scene that reflects something that actually happened in the manga. 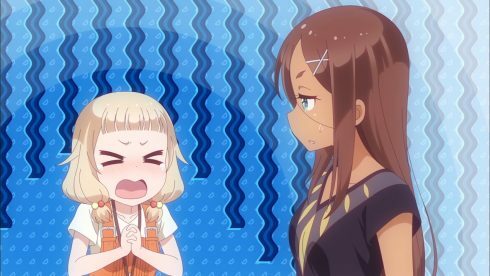 Basically, Nene showed one too many times that she can’t settle down and stay under control unless Umiko keeps a constant eye on her. 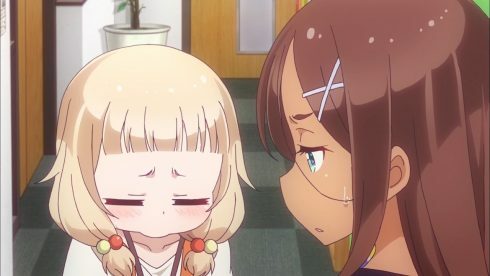 Since Umiko can’t always be over with the part timers, that means Nene ends up being relocated to sit next to Umiko. 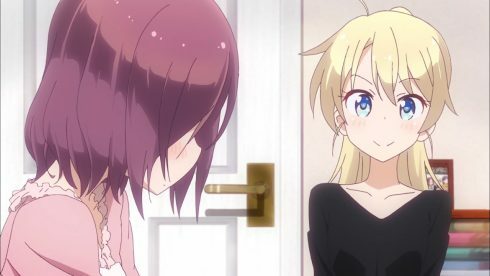 Nene seems particularly downcast about this (the anime has perhaps played up her fear of Umiko a bit more than seemed to fit from the manga), but Umiko looks particularly pleased. In fact, I’d almost describe her smile and the way she licked that cream off her lips at the end as being downright predatory. We’ll see what the future holds, shall we? For an episode that was almost entirely new content, this one worked pretty well. The tone fits the series, the characters behaved like themselves, and odds are if you haven’t read the manga you wouldn’t be able to tell the difference. And really that’s the way it should work. 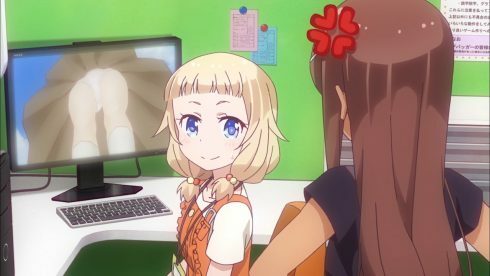 Come back next week for more cute women making cute games cutely. 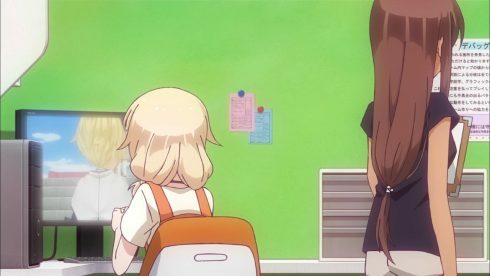 Nene’s image-bubble shoving its way in out of nowhere pretty much describes her behavior throughout the entire episode. But we love her for it.